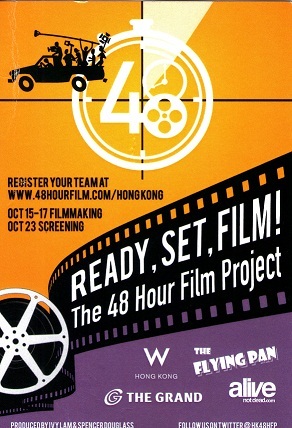 The 48 HOUR FILM PROJECT is a yearly event happening around the world where filmmakers gather and make short films within 48 hours (rather straightforward, isn’t it?). Having been in film school and around people involved with film, this is the second year in a row that someone I know is involved in the contest’s Hong Kong stop. The filmmakers have worked very hard, and they will be screening the fruits of their labor on Saturday, October 23rd, at Hong Kong’s The Grand Cinema. While I won’t be at the screenings myself (HKAFF! ), I am showing my support for my friend Seth and the contest as a whole by encouraging you all to make it to the screening if you’re in Hong Kong. One of last year’s winners ended up being screened at this year’s Hong Kong International Film Festival, so amateur filmmaking this ain’t. Don’t believe me? Go to The Grand Cinema on the 23rd and check it out yourself.